Dabu block painting is one of the oldest fabric painting techniques of India and is majorly undertaken in the state of Rajasthan. The art was almost dead in the last century but has come back to life and has become famous amongst the ethnic fashion lovers in India. The art of Dabu block painting is extremely labor intensive and needs special skills and patience to make. The printed fabric displays a very unique style of fashion and is frequently used in the production of many indo-western clothes. 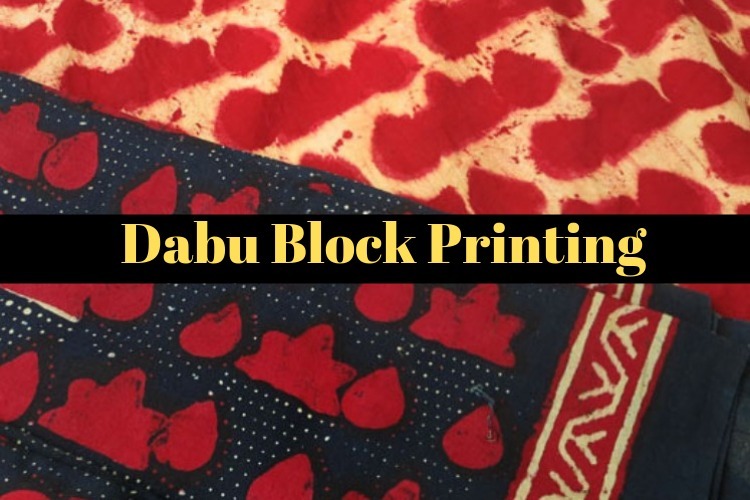 Dabu is a mud resist, a hand-block painting made on a fabric using wooden blocks. The preparation of the mud resist clay is prepared by finely sieving it. Wheat chaff, gum (also known as gum in Hindi) and calcium hydroxide are the main ingredients used in making the ink of Dabu block painting. The mud from the dry pond is kept overnight to soak in water. Once this process is done, the mixture of gound and Beedan is added in the mud until it turns into a sticky paste. The printing on the fabric is done by wooden stamps or blocks. Once the printing is done, the fabric is kept under the sun to dry. It is then dipped into a vat of dye, and dried in the sun again. After this process, the fabric is washed properly to remove the paste and extra dye. This is a very time-consuming process which is what makes this fabric so unique and expensive. Dabu painting is done using all natural dyes like indigo (blue), kashish (dark brown), yellow and red. The artisans personally make these dyes. The design on the wooden blocks is used as a texture or pattern on the fabric. The designs are block painted by artisans which takes a lot of time. Dabu block painting is really an amazing art gifted to us by our ancestors. It is in our hands to keep the art alive and to propel it further globally in the fashion world. Why Indigo Colored Clothing is Trending – A fashionista’s perspective! 7 Ideas to Turn Everyday Clothing into Indo-Western Style!